Earlier this month we traveled home and had a little birthday celebration for my GiGi and my wonderful sister-in-law. I offered to make the dessert and asked my SIL what she might like and she said, "You what would be good..." and this was the result! Having eaten this cake a bazillion times at potlucks and at my favorite downtown Fargo lunch spot the VIP room (they call it BTS cake, which cracks me up! ), I am surprised I've never made it or had much thought about what actually went into delicious treat. It's surprisingly simple! Take note (because I didn't!) 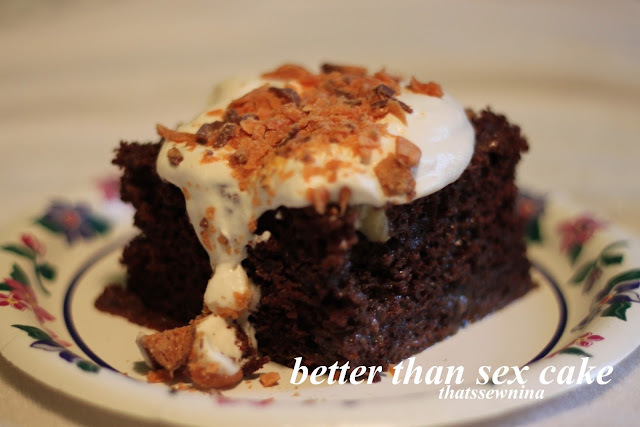 that this cake should be made a day ahead for maximum "sexiness". Make the chocolate cake mix as directed on the box (or make a homemade chocolate cake if you're fancy.) Using the end of a wooden spoon (or whatever you have handy), poke holes all over the cake. Pour the can of sweetened condensed milk over the top then pour the caramel ice cream topping over the top of that. Allow the cake to cool at room temperature then refrigerate for at least one hour, but it's truly best made a day ahead to really allow the topping to soak in. You can put the whipped cream on before popping it into the fridge or dollop on individual pieces as you serve. Sprinkle the top with chopped up Butterfinger or Heath toffee bar pieces. If you're feeling fancy, make your own whipped cream! Fresh is always better than the frozen chemical kind. Just whip up 1 cup of heavy whipping cream with 1-2 tablespoons of granulated sugar and 1/2 teaspoon of vanilla extract.